The house of Samson Occom in Mohegan, Montville, Conn. Drawing by John Warner Barber, ca. 1835. 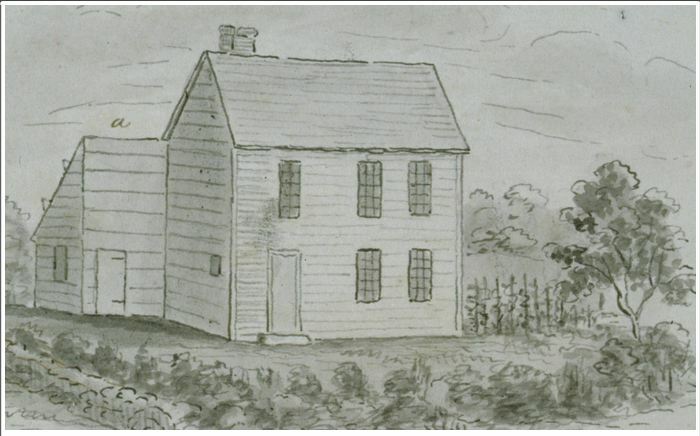 Occom is said to have lived in this modest frame house, using the lean-to as his study - Connecticut Historical Society, 1953.5.175. In the 18th century the most famous Mohegan was probably Samson Occom, a preacher and teacher, who also served as a tribal councilor, herbal doctor, fisherman, hunter, farmer, and was a father, husband, and brother. 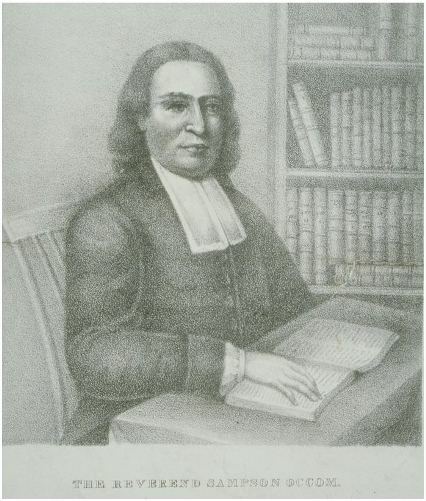 Born in Connecticut at Mohegan (now Montville and the Mohegan Reservation) in 1723, Occom converted to Christianity in 1741 during the Great Awakening, a period of extensive evangelical preaching. He was educated in Greek, Latin, and English at Eleazar Wheelock’s school in Lebanon, Connecticut, between 1743 and 1747. In 1758 he was ordained as a Presbyterian minister. He and his wife Mary Fowler had 10 children. Through his missionary work, Occom sought to renew diplomatic ties between the Mohegans and the Mohawks and Oneida, and helped to establish an group known as the Brotherton Indians, formed of Christian members of several Southern New England tribes. Shortly before the American Revolution, the Brotherton Indians began moving to western New York State, where Occom hoped they would be free from white influence and able to focus on self-determination and Christian worship. Occom died there in 1792. During the 1820s, the descendants of these Indians, after decades of pressure from increasing white settlement, relinquished their lands to the State of New York and moved farther west, to Wisconsin, where they established the town today known as Brotherton. Map of the East Part of the Colony of Connecticut. 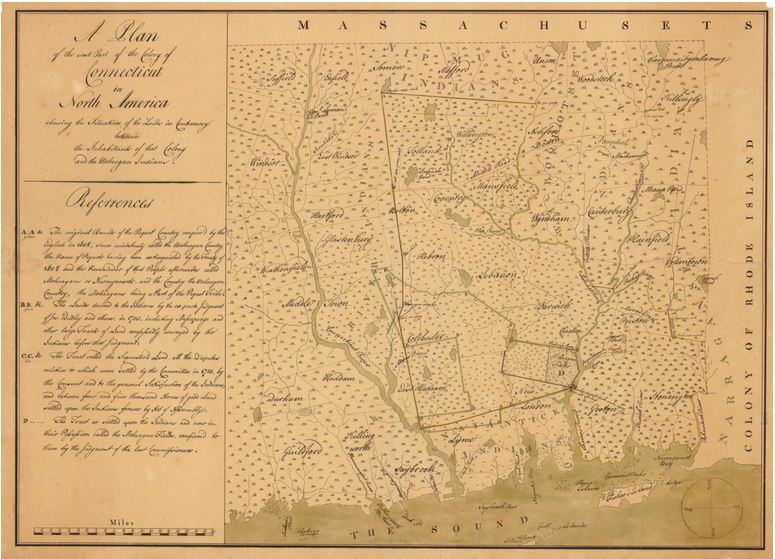 Manuscript map, ca. 1770. This map shows Mohegan lands claimed by the Colony of Connecticut – Connecticut Historical Society, 1913.9.2. The Samson Occom Papers at the Connecticut Historical Society is one of the largest holdings related to Occom in the US. The 236 items include letters, petitions, a diary, a donation book, sermons and speeches given by Occom, letters from his wife Mary, and sermons preached by his son in law Joseph Johnson. They provide an intriguing glimpse of the most famous Mohegan of the 18th century. “A Guide to the Samson Occom Papers.” Connecticut Historical Society, 2012. Link. Barber, John Warner. Sampson Occum’s House in Mohegan, Montville. ca 1836. Drawing, ink. Connecticut Historical Society. Link. Occom, Samson, and Jonathan Edwards. A Sermon at the Execution of Moses Paul, an Indian Who Had Been Guilty of Murder, Preached at New Haven in America. by Samson Occom, a Native Indian ... to Which Is Added a Short Account of the Late Spread of the Gospel, Among the Indians. Also Observations on the Language of the Muhhekaneew Indians by Jonathan Edwards, D.D. New Haven, CT, 1788. Link. Occom, Samson, and Joanna Brooks. The Collected Writings of Samson Occom, Mohegan: Leadership and Literature in Eighteenth-Century Native America. Oxford; New York: Oxford University Press, 2006. Brooks, Lisa Tanya. The Common Pot: The Recovery of Native Space in the Northeast. Minneapolis, MN: University of Minnesota Press, 2008.